Peptides are scientifically known to have anti aging results and improve other skin issues, too. If you have been using peptide anti wrinkle face creams and you are pleased with their function, you may want to try out an eye cream with peptides as well. Finding an effective peptide eye cream can help reduce many of the skin aging or fatigue signs in the eye area leaving you with a brighter and more youthful looking skin. So, here is a look at some of the best eye creams with peptides. 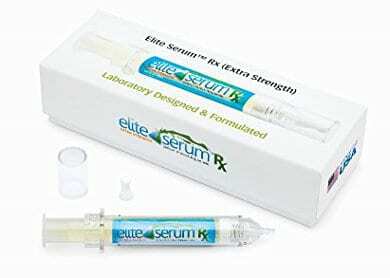 Elite Serum Rx is an award winning eye serum which is full of effective peptides to boost your eyes beauty. Athough it is not a cream but a serum, I felt l had to provide you with this top reviewed option especially since the company suggests that their serum has such a luxurious feel that it is like using a rich eye cream. This product contains all effective peptides like Argireline, Matrixyl 3000, SNAP-8, Eyeliss, Haloxyl and Syn- Coll, so it is really full of potent peptides to give you maximum results for wrinkles, fine lines, puffiness and dark circles. It also contains seaweed extract, hyaluronic acid, and glycerin. It can be used around the eyes. Described as a “fantastic product” by Centerchem and having earned the “Pharmacist Tested Seal of Approval” as well as other awards, Elite Rx is gaining lots of reputation in the skincare world. Let’s have a look at some further details. The product is applied with the use of a dispensing syringe for precise application. Although, as we have said before, the product’s consistency mimics that of a rich eye cream, it is 100% oil free and non comedogenic. It spreads easily, absorbs fast and doesn’t feel sticky. Users report very good results after using Elite Rx. They say that their puffiness and dark circles have improved and that the same goes with wrinkles and fine lines, adding that this is the only eye cream, from the ones they have tried, that actually provided them with some visible results to their puffiness. One reviewer even used it for her vertical deep lines above her lips with very positive results. People say that their eyes area appears moisturized and feels smooth while, even after the first use, some mentioned that they experienced a tightening effect that felt refreshing. Although this is not a cheap product, I would say that it is quite cheap compared to the prices of brand eye creams and the fact that people themselves state that it is worthwhile its price and that a little goes a long way. The Body Merry Eye Cream addresses a number of skin beauty deteriorating factors in the eye area such as wrinkles, dark circles, puffiness, fine lines and crow’s feet. The peptides that it contains are Matrixyl 3000 ( a more powerful peptide combination than Matrixyl), palmitoyl tripeptide-5 and dipeptide diaminobutyroyl benzylamide diacetate. Apart from peptides, it also has other top anti aging ingredients including botanical hyaluronic acid, coenzyme Q10, 2 types of vitamin C and vitamin E.
This cream contains a lot of natural and organic ingredients that are known to be skin beneficial such as aloe vera, squalane, castor oil, coconut oil, green tea, cucumber extract, chamomile, jojoba oil, rosehip oil, witch hazel and a lot of other natural extracts and oils. In fact, this eye product contains more than 70 skin ingredients. It is also free of harsh chemicals and cruelty free. It is made in the USA and is suitable for all skin types of both women and men. Finally, it is followed by a 90 day money back guarantee. 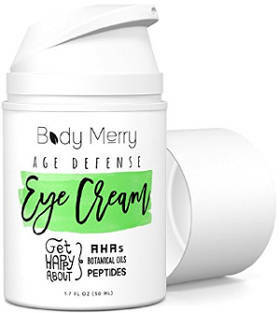 Users feel that Body Merry peptide eye cream is easy to apply, absorbs well, and a little of this cream goes a long way making it a good value. They like its very light texture and say that it leaves their skin feeling soft and smooth. Some people have seen better results with puffiness than with dark circles while a lot of them share a positive feedback but their review is a little premature and they need to give more time to the product. Still, there are also a lot of reviews about the positive results of this product for dark circles. While this eye product will most possibly not be the “miracle cream” you might be after, users report that it helps to reduce fine lines under the eyes and crow’s feet. It also feels refreshing when applied. In addition, there were some comments regarding its smell. While some people love it, few others are not so happy with it. Still, as one reviewer commented, the smell might have been changed by the company after a few of these negative reviews started popping out. Also, I would say that the issue of smell is so subjective that no safe conclusion can most of the times be drawn by people’s reviews, unfortunately! The Azure Naturals Ultimate Peptide Eye Gel is a 97% natural and 72% organic eye gel which contains the peptide Matrixyl 3000. It also includes plant stem cells, cucumber and botanical hyaluronic acid. Some other ingredients are organic aloe, organic jojoba oil, MSM, silk amino acid blend, wildcrafted Reishi, organic Gotu Kola and vitamin E.
This eye product comes in a 1 ounce container and is free of parabens, alcohol and GMO’s. It does not contain gluten and is cruelty free. It is made in the USA and followed by a generous 1 year money back guarantee. According to the company, Azure Naturals Peptide Gel addresses all issues concerning the skin around the eyes such as dark circles, sagginess, wrinkles, fine lines, puffiness, loss not only of plumpness but also of firmness, resilience and tone. Users give this natural and organic eye gel top ratings and state that it goes on smoothly, absorbs quickly and doesn’t leave behind any sticky residue. It reduces wrinkles, under eye puffiness and dark circles. They especially notice that their crow’s feet seem to practically disappear and that it tightens sagging skin underneath the eyes. It also hydrates the skin around their eyes nicely and leaves it feeling soft and smooth. While some users note positive changes rather quickly, others find it takes several weeks for positive results to be really noticeable. 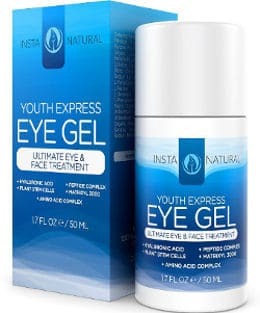 The InstaNatural Youth Express Eye Gel for wrinkles, dark circles and bags comes in a 1.7 ounce container which is much bigger than lots of other eye creams sold on the market today. The peptides it contains are Matrixyl 3000 and Palmitoyl Triepeptide-3. Other components include hyaluronic acid, MSM, amino acid complex and vitamin E.
This eye cream contains natural and organic ingredients and is free of parabens, alcohol and sulfates. According to the company’s claims, it is suitable for all skin types and can be used by both women and men. It is also offered with a lifetime money back guarantee. Users give this eye cream gel above average ratings and find that it works great for their eye area. They state that while it does take some time to see results, the product diminishes dark circles under the eyes, helps to tighten the skin, reduces the appearance of under eye bags and minimizes wrinkles. They also report that it brightens skin around the eyes and leaves it feeling smoother and super hydrated. It goes on easily and absorbs fast. Users with sensitive skin have mentioned that it doesn’t irritate their eyes or the skin around their eyes. Finally, people sometimes use it all over their face since the amount of it in the container is plenty. There were also a few people that didn’t experience the desired results. Derma e is a well known natural skincare company with lots of funs. 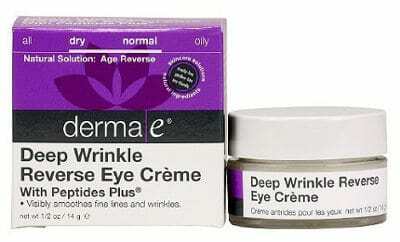 Their deep wrinkle reverse eye cream contains two potent peptides on the top of the list which are Matrixyl and Argireline. Other ingredients include organic jojoba oil and green tea while almost in the end of the list, vitamins A and E are mentioned. According to the company, this peptide eye product strengthens and protects the delicate skin around the eyes while smoothening away deep wrinkles, fine lines and crow’s feet as well as preventing the formation of new ones. This eye cream like all derma e products has not been tested on animals. Users are very pleased with the performance of this cream, its quality and price. They report that they experience an improvement in wrinkles and definitely in fine lines while it also makes their skin feel smooth. Some of them have also seen positive results with their puffiness. Although the jar is small, it last quite a while since a little goes a long way. According to the company, the Toulon Eye Cream contains some anti aging ingredients with the exact tested effective ratios. These include vitamin C, coenzyme Q10, green tea and vitamins A, E as well as exfoliating AHA acids like glycolic acid, lactic acid and alpha lipoic acid. This eye cream is described as a mild but at the same time strong, rich and non oily moisturizer that will lessen your wrinkles, improve puffiness and lighten dark circles. This product is free of parabens and fragrance. It is also gluten free as well as cruelty free. It is sold in a 5 ounce glass jar and is made in the USA. Your order is followed by a skincare free ebook and a 60 day return policy. People’s reviews appear to be very good. 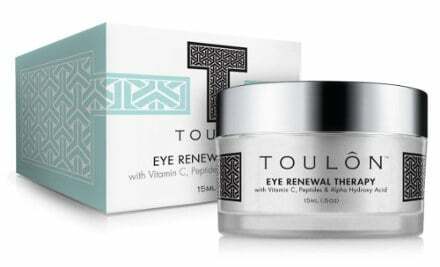 Toulon eye cream has a nice rich consistency, and goes on smoothly. A little goes a long way and it normally lasts for 2 or 3 months. Users say that it did reduce, although not gotten rid of, dark circles under their eyes, and also minimized puffiness and the appearance of fine lines. In addition, they feel that it results in smoother skin around the eyes. Nevertheless, there were few people reporting irritation in the eyes area. Since I was not able to find the full list of ingredients so that I can conclude which components can be irritating, the only thing I can guess, in this case, is that the AHA acids that this cream contains can be irritating for some people especially when applied close to the eyes. In conclusion, peptides are included in the top anti-aging skincare ingredients today and are suitable for dealing with skin aging signs both on the face and in the eye area. This review should hopefully have helped you to learn more about the peptides benefits and find the best eye cream with peptides.